For boys and girls who are fond of rubber: wear our latex stockings as a solo accessory or paired with catsuits, shorts or bodysuits! Approximately hip-length, available in black or transparent. Premium MEO quality: seamlessly dip-coated. My wife placed the order for these and was afraid they would be too small. She ordered way too big of a size. But with that said, these were still incredibly hard for her to get on. We have never used latex stockings before, so we google searched for tips and tricks. It seems lubricant is almost necessary to get these on. And Roll them up like a sock and start with the toes in first so you don't get a big air bubble in your foot area. These leggings seem very study and the color quality is very good . I will probably buy another color from these MEO guys in the future . 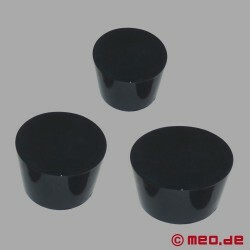 I have bought a number of items from MEO and everything has fit well and was well made . I also have received all items sooner than what was advertised . I'll definitely be buying from these guys in the future!